Ravi Chaudhary (front row, center) with active-duty and retired AAPI members of the armed forces. Giving a voice to communities all across America has been a hallmark of President Obama’s administration. Dec. 5, 2016 marked yet another milestone, as the President’s Advisory Commission on Asian Americans and Pacific Islanders (AAPIs) convened the first National Forum for AAPI Military Members and Veterans at the National Women in Military Service Memorial, Arlington Cemetery. 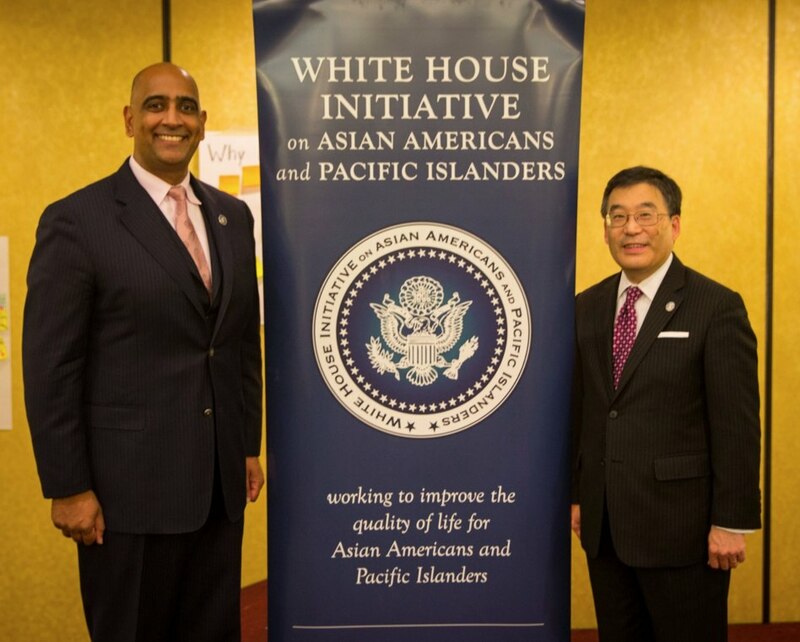 As a member of President’s Advisory Commission on AAPIs, it was a privilege to continue the conversation in an ongoing journey for the AAPI community. Attendees hailed from all of the military services and represented a wide range of ranks, from senior generals to young enlisted service members and even students from the service academies. There were wounded warriors among us, as well as members of our greatest generation who fought for our freedoms during World War II. They traveled from all over the nation in order to honor our nation’s heroes, discuss ongoing challenges, and make recommendations for the future. Most importantly, it was an opportunity for AAPI communities to come together under the same roof to discuss issues in the military common to all. AAPIs are the fastest-growing racial group in America. 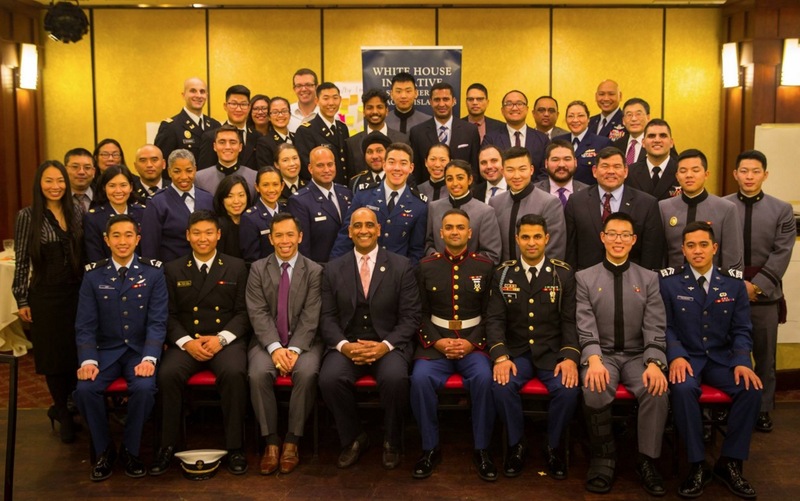 As this diverse demographic continues to grow, so too are thousands of AAPIs courageously raising their right hands to serve their nation in the military. AAPIs have served with pride in the military throughout our nation’s history. Filipino Americans manned defensive batteries at the Battle of New Orleans during the War of 1812. In the U.S. Civil War, individuals like Chinese American Corporal Joseph Pierce fought at the battles of Antietam and Gettysburg. Ravi Chaudhary with Rep. Mark Takano (D-Riverside), who serves on House Committee on Veterans’ Affairs, and Floyd Mori, president/CEO of Asian Pacific American Institute for Congressional Studies. Despite the discriminatory provisions of the Chinese Exclusion Act, Chinese Americans fought under General Pershing in the Mexican Expedition in 1916. During World War I, Bhagat Singh Thind was an Indian American from the Sikh faith tradition who served honorably in the U.S. Army and eventually took his fight for citizenship to the U.S. Supreme Court. 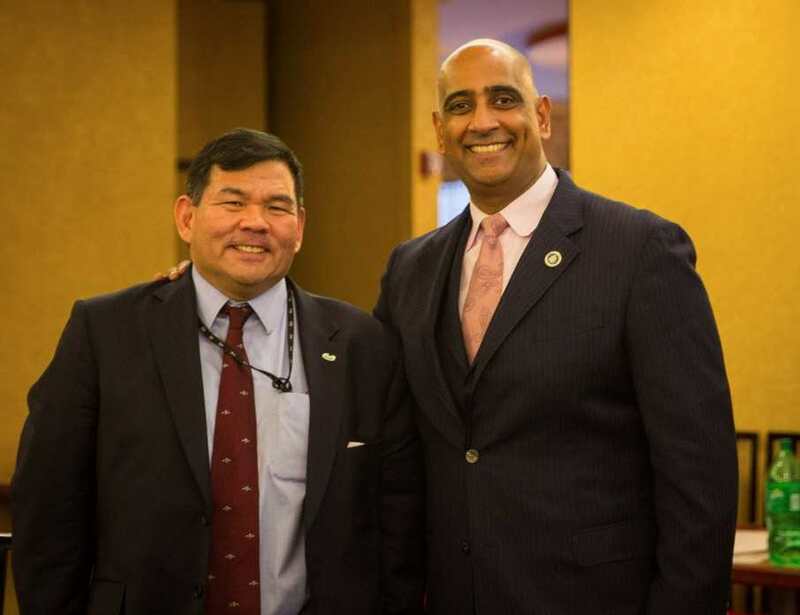 Ravi Chaudhary with Michael Yaguchi, who has worked for NATO, the Veterans Benefits Administration, Department of Veterans Affairs, and Department of Defense. During the forum, Army Secretary Eric Fanning declared in his keynote address that the foundation of American military power rests in the “power of our example,” which is the reason our nation has the finest military in the world. Throughout the day, the colorful sights and sounds of AAPI artistic culture and stories of dedicated service stirred emotions among attendees. Young service members reflected on the dedication of Thomas Sylvanus, a Chinese American who served during the Civil War and endured the brutality of capture after being wounded in battle. 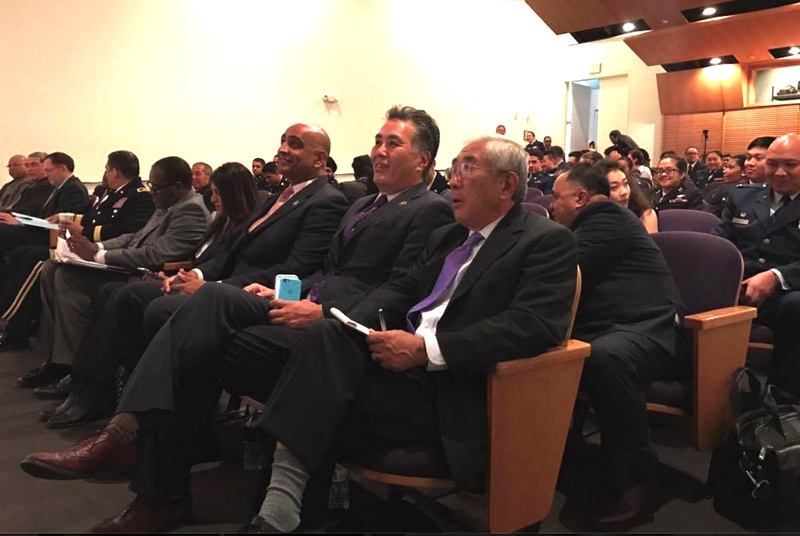 Leaders like Congressman Mark Takano told the harrowing story of his family’s internment during World War II, honored Filipino World War II veteran Celestino Almeda for his service, and reflected on the importance of correcting the wrongs of the past. The entire forum rose in applause in support of Mr. Almeda, and just a few weeks following the forum, the president signed into law the Filipino Veterans of World War II Congressional Gold Medal Act of 2015, which awarded the Congressional Gold Medal to the Filipino Veterans of World War II in recognition of their dedicated service. Lt. Col. Allen Goshi (retired), deputy associate solicitor at the U.S. Department of Labor, formerly of the NATO Office of Chief Prosecutor for Military Commissions, with Ravi Chaudhary. After a morning of thought-provoking discussions, Assistant Secretary of the Air Force for Manpower Gabe Camarillo launched a session designed to gather information from AAPIs on future strategies for diversity and inclusion. Senior generals and civilian leadership from the Department of Defense and Veterans Administration partnered with our youngest service members to discuss key challenges, and employed “Design Thinking” tools in order to develop strategies for the future. The teams discussed ways in which they can interact with federal agencies, an activity that will provide valuable input to support the recently signed Presidential Memorandum supporting new American service members, veterans, and their families. Community stakeholders represented the Japanese American Veterans Association, Virginia Asian Chamber of Commerce, Vietnamese American Uniformed Service Member Association, Asian American Government Executives Network, Asian Pacific American Institute for Congressional Studies, and the Sikh Coalition. The day’s events helped ensure that military and veteran families not only have a voice, but an opportunity to shape the future for the better. Ultimately, the issues discussed at the forum won’t be solved overnight. But by focusing on the values that make our country great, we stand a better chance of continuing to exemplify the motto written on our nation’s Great Seal, “E’Pluribus Unum” – that out of many, we are one. Ravi Chaudhary was a member of the President’s Advisory Commission on AAPIs.